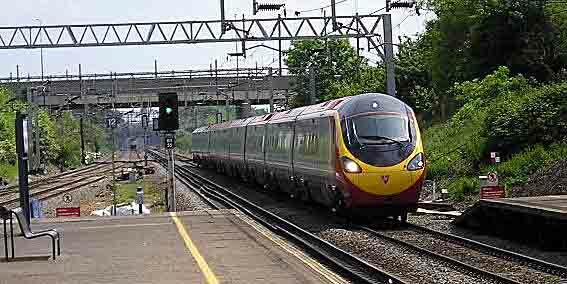 Here's a Virgin Rail Pendolino cruising through the Milton Keynes (UK) station on the West Coast Main Line at something approximating full speed (125mph +) in May, 2004. Built by Fiat and Alstom, and using a tilting mechanism, which permits it to maintain speed through curves, the Pendolinos (or 'Pendos' in normal parlance) are used heavily on Euston-Liverpool and Euston-Manchester routes, with Glascow coming along soon (if not already). I give them mixed reviews. Their rides don't seem as comfortable as the venerable old trains they are replacing, and the airline style interiors seem cramped, with odd sight lines. But they feature at-seat entertainment systems throughout, a rather nice shop that sells a variety of food and consumer items, nice big clean windows (take note Amtrak! ), and good complementary food for those in first-class. I rode British trains a great deal this year and found that on many counts service is improving on most of the main lines. Virtually all trains I rode were on time, they were clean, and even on remote rural routes food was often available at a very fair price. 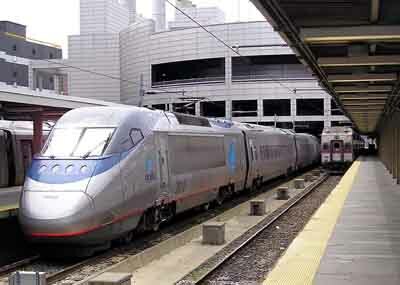 As opposed to the USA, the UK government sees rail transport as a national priorty and although privatization has left a bit of an infrastructure mess, there are more and more trains to ride, Richard Branson has invested a fortune in Virgin Rail, and, all in all, attitudes about customer service are improving. 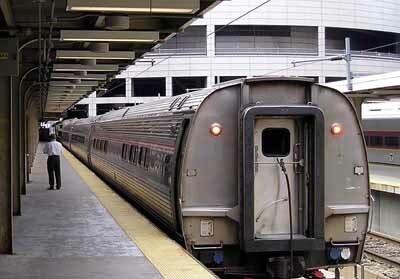 Consolidation is in the air and it is likely that in a few years there will only be four or five major rail companies, but at least investments in new equipment, track improvements, and stations are being made on a national basis. Berkeley, California, 2004. A Capitol Corridor train on the way to Sacramento stops by with a colorful promotion on wheels. One can't ride one of these trains, as I did once again during my visit to the Bay Area, without being impressed by creative branding, spotless windows and cars, on-board personnel who seem to enjoy their work, and a general sense of growth and excitement. Of course, the Union Pacific doesn't set high standards with its time keeping (many trains I saw were running late), but public pressure to add trains and improve service seems to be having positive impact. One cannot come away without hoping that some of what Amtrak California is doing could rub off on the Amtrak long distance trains running in the area (I photographed a really dirty California Zephyr on its way to Chicago for the second time this year) but perhaps a new maintenance facility in Oakland will make a difference. When I see an 'ice cream car' on the NE Corridor maybe the adage that 'California leads the way' will apply to trains to make up for all those years exporting freeways. And, a little pizzazz never hurts! It's the day before Thanksgiving 2004, and here's the Coast Starlight rumbling through Berkeley, California, on its way from Seattle to Emeryville and Los Angeles. I counted 13 cars and noted happily that the train was gleaming (as was the California Zephyr I saw a few minutes later). We enter the New Year soon with Amtrak still running, the wolves still circling from a distance, passenger count up, a nation in deep peril from its oil gluttony, more and more gridlock on the ground and contempt for customers and bloated subsidies in the air. 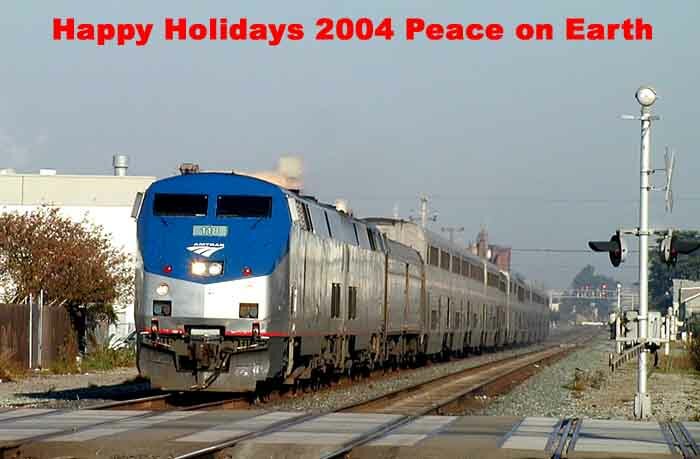 There are many signs of passenger railroading hope, and so from yours truly and Friends of Amtrak here's to thinking positively and having a really great train ride in 2005! Changes last made on: December 12, 2004.